2. Contest Period. The Contest will begin at 10:00 a.m. CT on Tuesday, January 22, 2019 and will run through 6:00 p.m., CT on Friday, January 25, 2019 (the “Contest Period”). The Station’s computer is the official time keeping device for this Contest. On-Air: Listen to the Station weekdays from 10:00 a.m. to 6:00 p.m. CT during the Contest Period. When the Station announces the “Alabama 50th Anniversary Cue-To-Call,” listeners should call the Station at 850-244-1055. Caller five (#5) to the Station, as determined by the Station in its sole discretion, will be entered to win. Time Delay Between Over-the-Air Analog Signal and Internet Broadcast: Due to the time delay that exists between the Station’s analog over-the-air signal and the Station’s online webcast, listeners who listen to the Station online may hear the cue to call later than listeners listening to the Station’s analog over-the-air signal. As a result, the odds of an online listener entering this Contest on-air may be diminished. 4. Winner Selection. Winners are determined during the call process outlined above. Subject to verification of eligibility and compliance with the terms of these rules). Station’s decisions as to the administration and operation of the Contest and the selection of the potential winner are final and binding in all matters related to the Contest. Failure to respond to the initial verification contact within three (3) days of notification will result in disqualification. 6. Grand Prize. Five (5) Grand Prizes will be awarded in this Contest. 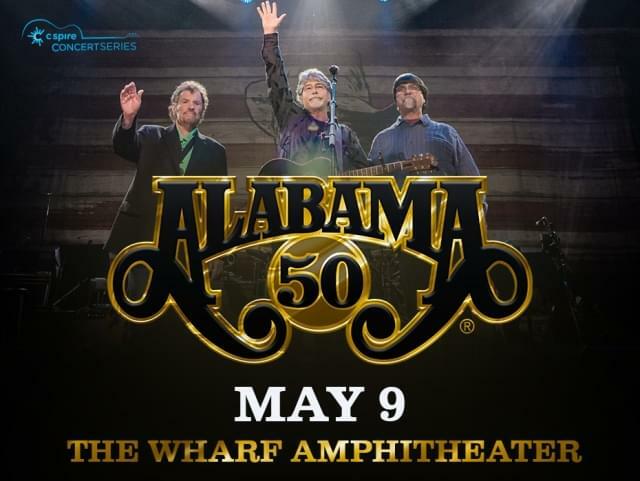 Each Grand Prize is one (1) pair of tickets (two tickets) to ALABAMA’s concert with the Charlie Daniels Band scheduled for Thursday, May 9, 2019, at The Wharf Amphitheater in Orange Beach, AL. ARV is approximately one-hundred dollars per prize ($100). Winner is responsible for all taxes associated with prize receipt and/or use. Odds of winning the Grand Prize depend on a number of factors including the number of eligible entries received during the Contest Period and listeners participating at any given time.